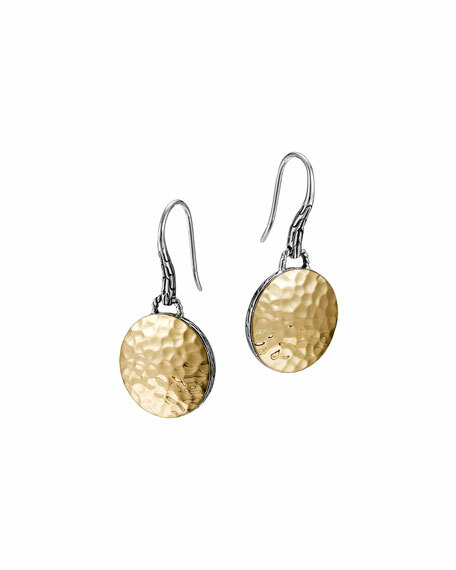 John Hardy Palu drop earrings feature a soft texture inspired by the face of the moon. From the John Hardy Palu Collection. Sterling silver with 18-karat yellow gold plate. Hammered discs with chain edges. Approx. 1 1/3"L (35mm); disc, approx. 2/3" diameter (16.5mm). From the Classic Chain Collection. Sterling silver. Woven chain post setting adorned with black sapphire insets. Pierced backs. Approx. 0.5"